Great Puma (NES Pro Wrestling) for Super Smash Bros. 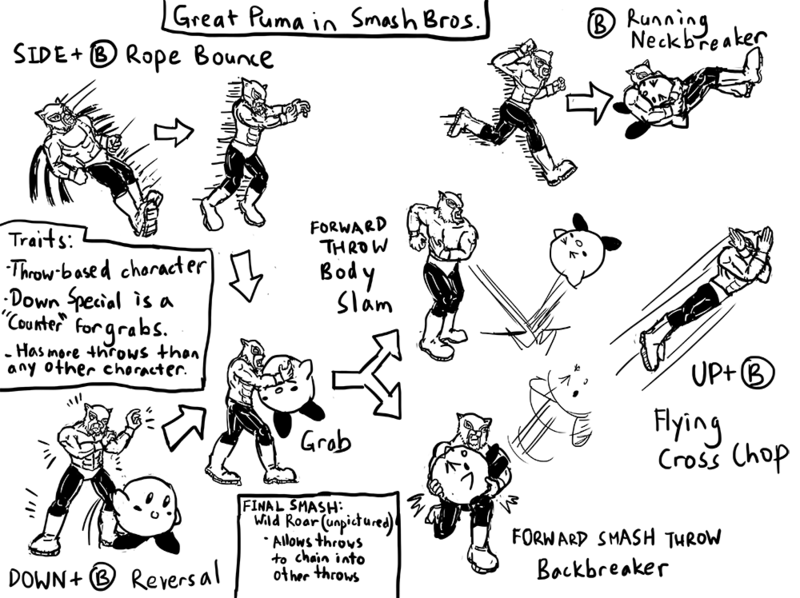 Unlike the previous characters I drew movesets for (King K. Rool, Princess Daisy), Great Puma is much more obscure. He’s the final boss from Pro Wrestling for the NES, and notoriously difficult, if only because all the button mashing you had to do to defeat him would hurt your thumbs (unless you used a turbo controller). The reason I decided to draw Great Puma over the other wrestlers is because he 1) is a villain/antagonist 2) represents a popular retro series 3) has that final boss characteristic of knowing all of other wrestlers’ moves, which allows him to represent the full repertoire of Pro Wrestling. Kirby is depicted as the victim because I wanted to get across how the moves would look on someone distinctly non-humanoid. As a Smash character, Great Puma specializes in holds and throws. He not only has more throws than any other character in the game, but he has two special moves that also facilitate grabbing the opponent. His Rope Bounce is sort of like a pseudo-wavedash in that it allows him to quickly retreat and then spring forward into a grab animation. His Reversal works like Marth’s Counter but it activates only when the opponent tries to grab him, which causes Great Puma to grab the opponent instead. Even his Running Neckbreaker is considered a throw, which overall makes him a difficult opponent to shield against. His Flying Cross Chop is surprisingly powerful but is only mediocre in terms of stage recovery. His Final Smash, Wild Roar, allows Great Puma to link up to three throws together. This isn’t quite the same thing as a chain grab, as that involves grabbing the opponent immediately after a throw and then repeating. Rather, this allows him to do things like Grab -> Pummel -> Backbreaker -> Piranha Bite -> Piledriver before the opponent goes flying. Also not pictured are most of his moves, such as his back-air being Fighter Hayabusa’s Back Brain Kick (Enzui Giri) and his forward smash being Giant Panther’s Iron Claw. I changed his tights because I think they just look better this way. This entry was posted in art, smash bros, video games and tagged great puma, pro wrestling, smash bros 4, tablet. Bookmark the permalink.